A fresh pizza straight from the oven at Vincent's Pizza Park in North Braddock. When it comes to pizza, everyone knows Chicago has deep dish and New York has a thin, foldable crust. While it’s hard to say for certain, Pittsburgh pizzas seem to have a couple of things in common. Two pizzas cook in Vincent's decades-old electric ovens. Owner Lisa Zollner says years of baked-in flavors adds to their pizzas. Gagliano credits Pittsburgh’s sturdy pizza to its steel roots. That kind of hearty pie is something Vincent’s Pizza Park in North Braddock has excelled at for nearly 70 years. While it was first opened in 1950 by Vincent Chianese, it closed in 2012 amidst a lawsuit. It reopened in 2013 and is currently run by the late Vincent’s granddaughter, Lisa Zollner. “It’s Pittsburgh pizza,” Zollner says of Vincent’s signature oblong pizzas, known for mountains of toppings and “lake Vincent’s,” the pool of grease that can only be formed on a pizza with that much cheese. Vincent’s also took first place in the Incline’s 2017 pizza bracket, which featured 32 pizzerias. “They don't skimp. They got tons of stuff on it,” says Jim Rhoades, who has been going to Vincent’s since he was a kid. Of course, Vincent’s isn’t the only local pie shop with a heavy hand. “We're not afraid to put the cheese on the pizza. We put a lot of cheese on our pizza,” says Dominic Mineo, owner of Mineo’s in Squirrel Hill. He describes Pittsburgh style pizza as closer to a New York style, but still with a substantial crust. Kevin Seibert, a longtime employee of Fiori’s in Brookline, also says you have to have a hefty crust and lots of cheese. … according to a 2014 data crunch by consultancy Targeting Solutions, Pittsburgh—which by the way has one of the largest Italian-American populations in the United States—also has the highest pizzeria density of any American city except Orlando, Florida. Ten pizza joints per 10,000 people. And there are so many kinds of pizza in the Pittsburgh region; Beto’s is famous for topping theirs with cold cheese, while Slice on Broadway has a thin, chewy crust. So, what might make it unique is that diners can really find whatever they’re looking for -- even if it’s grease. 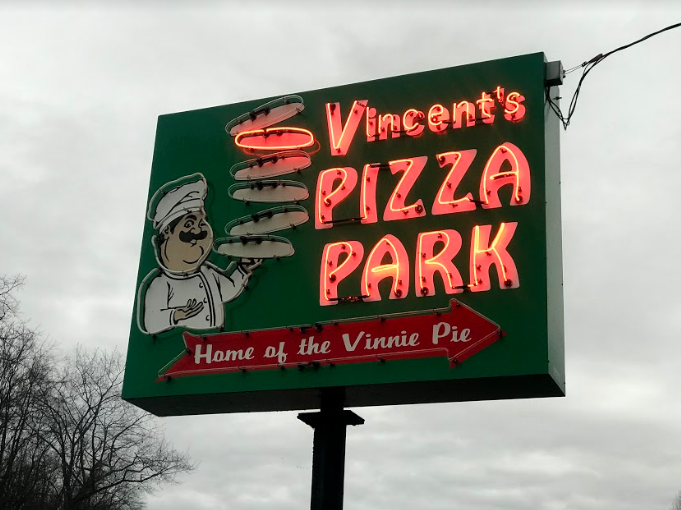 *This story has been updated to reflect that Vincent's is in North Braddock. Bike Pittsburgh released its second-ever survey on how Pittsburgh cyclists and pedestrians feel about sharing the roads with self-driving cars. Pittsburgh city officials say they have fired a salt truck driver who badly damaged a parked car in January and didn't report the crash. Pittsburgh Department of Public Works Director Mike Gable confirmed the termination Tuesday but did not provide details. The Pittsburgh Post-Gazette reports the mayor's office indicates the termination occurred Friday. Twenty Pennsylvania counties are under a state-imposed Code Orange Air Quality alert, including Allegheny, Beaver, Westmoreland and Washington counties. This is due to higher than normal levels of fine particulate pollution, which are tiny particles that can be inhaled and cause health problems.